As part of our basement renovation, we are updating the floors throughout, which means removing old tile and prepping the area to lay vinyl plank flooring. 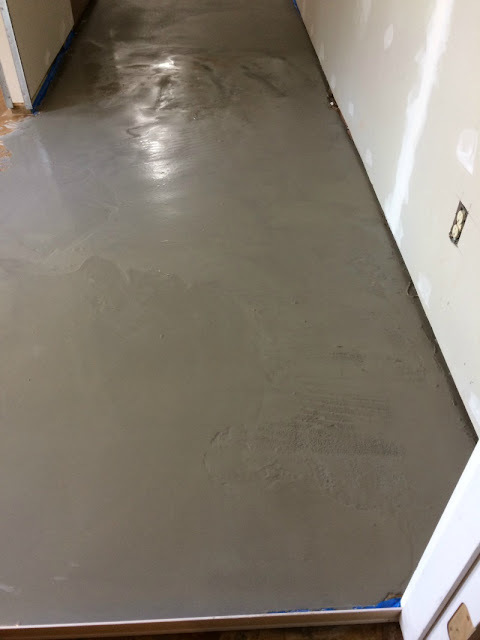 To be honest, this whole process was harder than I expected it to be, so I wanted to share my experience with you, along with tips on how to use self leveling cement. Disclaimer: We are not professionals, this is just some of the things we learned from the process. 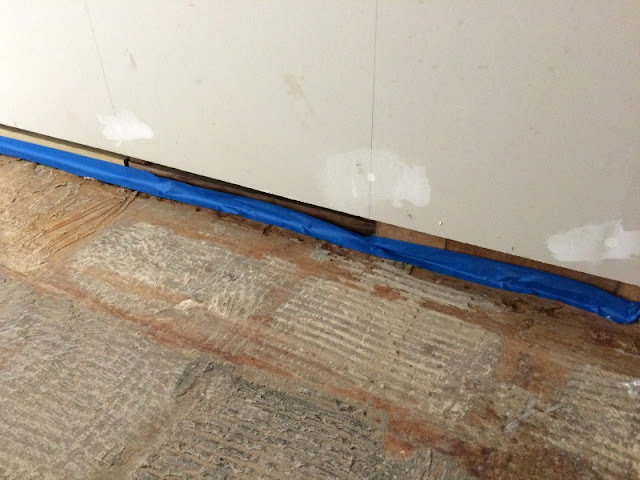 Once we removed the tile, there was still places where the floor was not smooth due to the mastic. 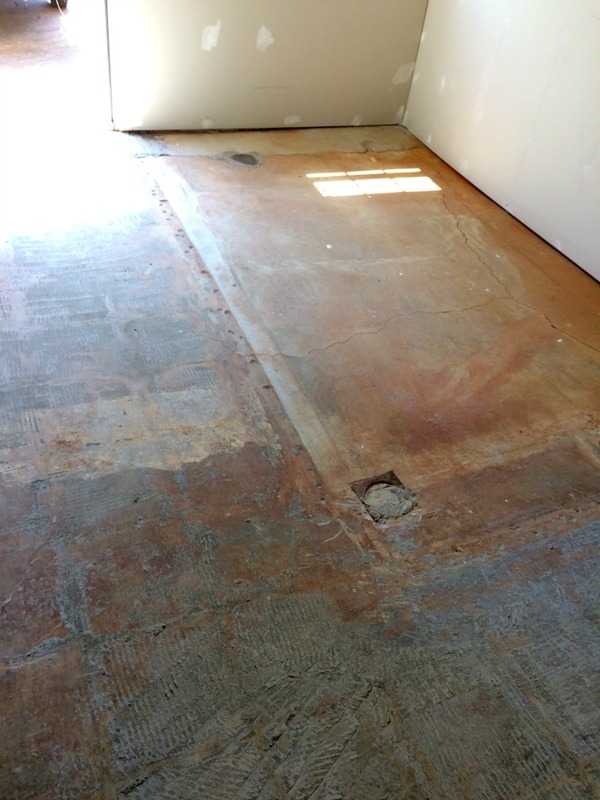 also, there used to be a drain in the middle of the floor (which one of the previous owners had filled with cement) so the floor was pitched toward the drain. 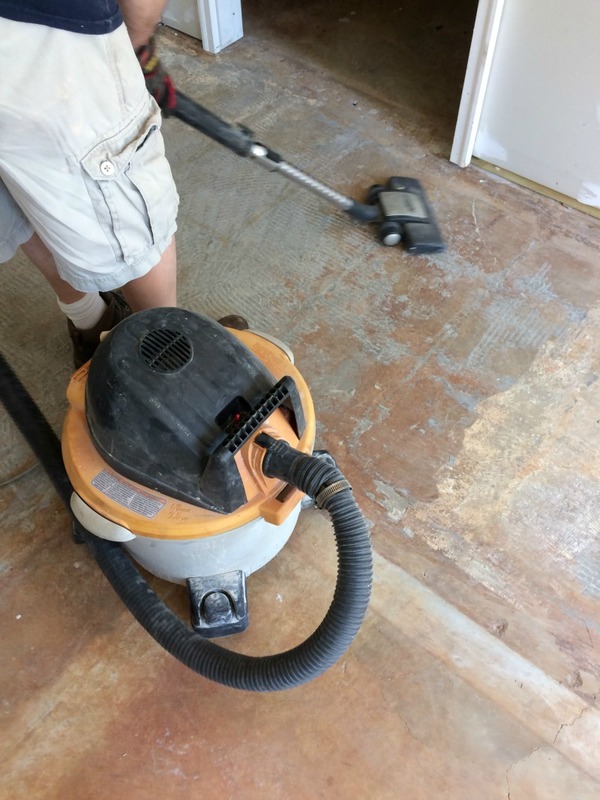 We needed to address these issues before laying the vinyl plank flooring. Fill in any large cracks or holes prior to starting the project. We had a couple of large holes where the plumbing came in to the old bathroom we tore out. My husband filled them with quick drying cement. Make sure your floor is clean. We swept it, vacuumed with the shop vac, then mopped it. Apply 2 coats of primer according to the directions on the bottle and let dry. We applied the primer with a regular paint roller. 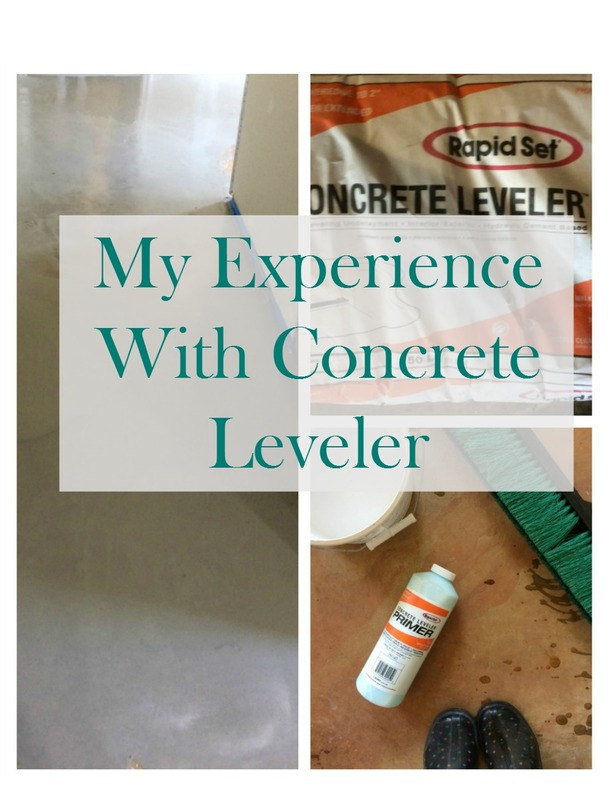 If there are any places on your floor where the leveler can seep under, you will want to seal it with painter tape. We also used a piece of molding to block off the area where the garage door threshold will be. You want to have a container marked to have the exact amount of water to mix in each bag, so I used a Sharpie to mark the fill line on a milk jug. 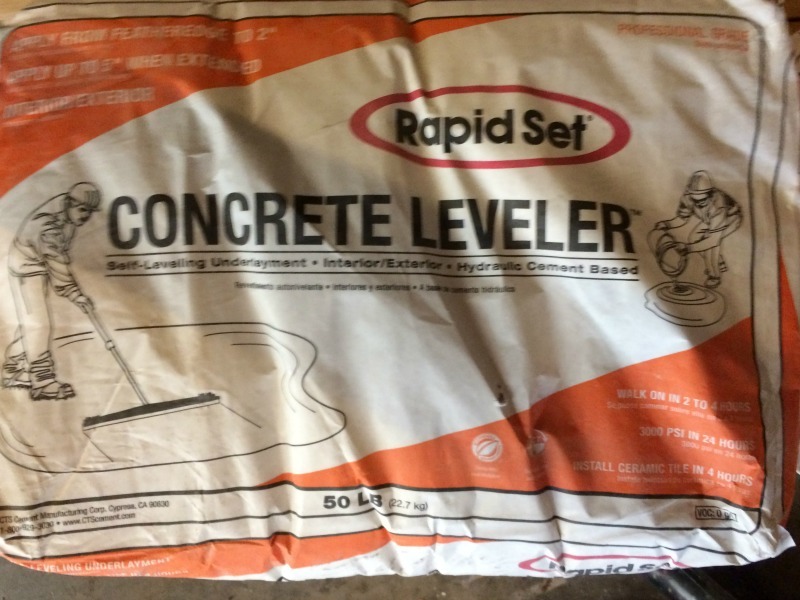 Add the water first, then the leveler mix and mix for the recommended time on the bag. 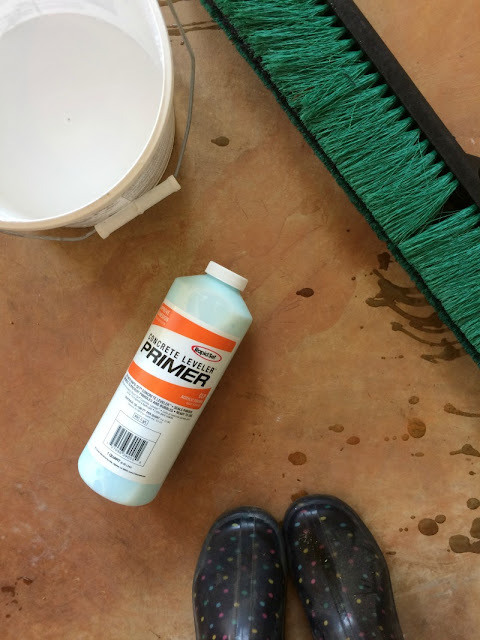 Spread it on the floor, working quickly because it sets within minutes. Once it dries, you are left with a smooth surface for your flooring. 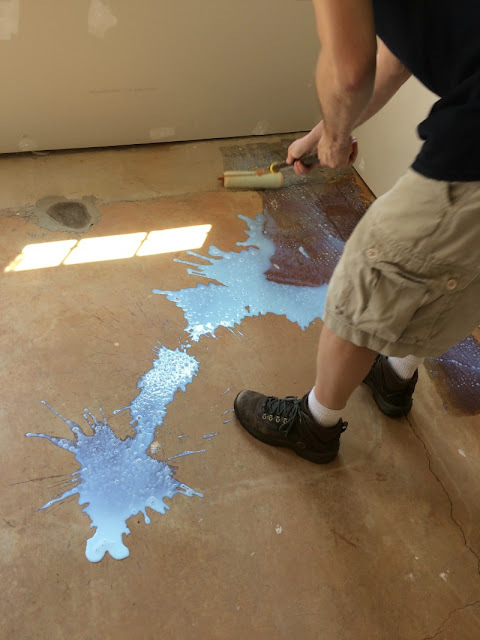 I filmed a short video of my husband spreading the mixture. We used a wide garden rake turned upside down, but other people have used rollers or push brooms. 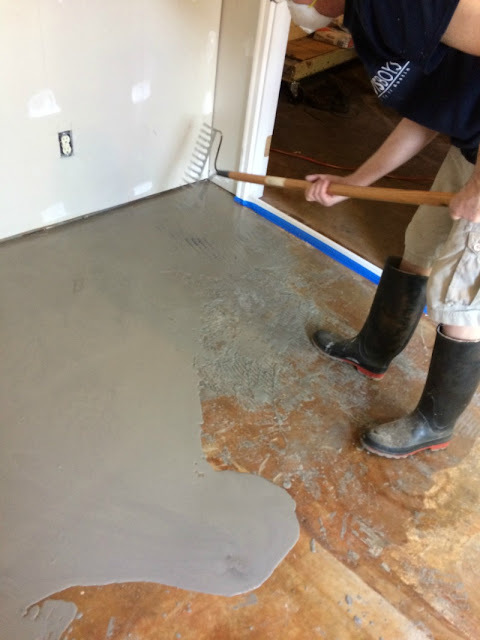 You can also smooth it using a trowel. 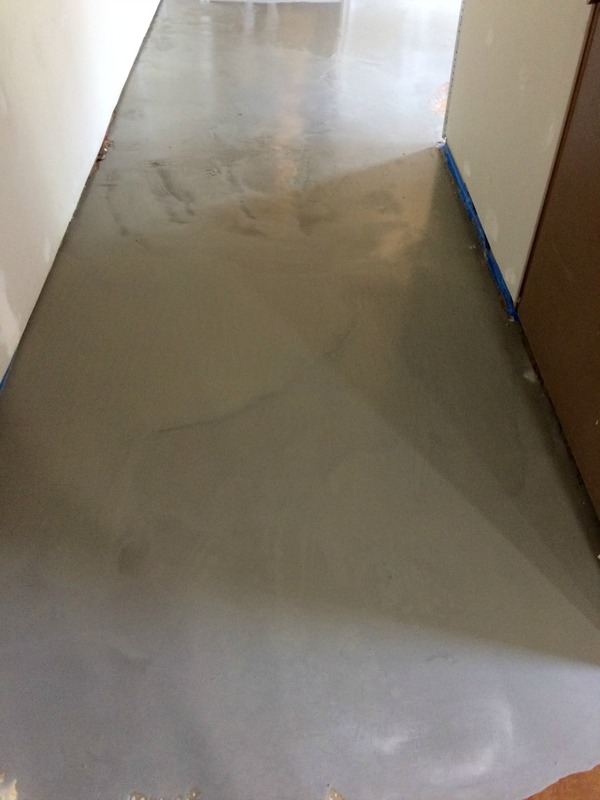 Make sure you are wearing a dust mask and goggles while mixing the cement. Mix outside! We used our drill with a paddle attachment that we use for stirring paint. Even though we only mixed one bag at a time in a large trashcan, it still splashed out and made a mess on my husband and the ground around it. Work quickly...it starts to set up within minutes, so be ready to spread it when you pour it out. We are happy with how it came out, even though there were a few spots that we did not smooth out enough. Interesting! I have never heard of this type of product, but I can see how it could be quite useful! 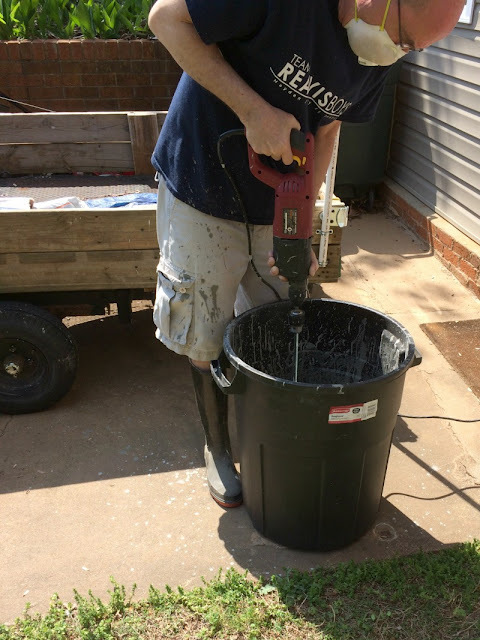 You and your husband have been on a roll with the home improvement projects, I wish I could find more time to do these types of big projects!! !